The wake-up call cut my dream short and I immediately noticed it was a much brighter day on Sunday morning. I also noticed it was closing in on 10am � the start time for the show. What the CD?!!!!! I sprinted through my shower, dressed and bolted out the door for the breakfast buffet (which was excellent, btw)... only to discover the hallway was empty and all the doors still closed. Good Grief!!! Daylight Savings Time had expired. After a delicious made-to-order omelet, a second re-fill on my coffee and some nice conversation with a member of the industry I still had enough time to shave before surrendering my room. I uploaded my weekender and my feed-bag into the Tracker that had been waiting patiently in the parking lot about 30 feet from the front door of the Best Western before heading through the hallways to the Sheraton for Day Two. Not a long walk. It was a delight to see Totem Acoustic returning to its former prominence in a large room and always a pleasure to see Vince Bruzzese who has been absent from the previous couple of shows I've covered. His son was hosting on one occasion and a dealer on another while Vince was taking care of other aspects of the business. Part speaker builder, part philosopher, Vince always champions a holistic approach to life and the importance music has in it. The writing is often on the wall as seen in the first photo. And often there is a trompe l'oeil, as in the second photo � always celebrating life. The Tribe 5 speakers seen in the first photo are personal favorites but it was the Forest Signatures � what? 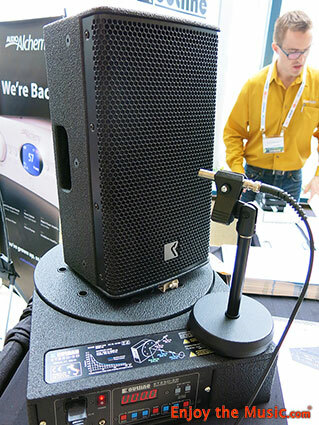 Another speaker powered by Naim electronics(?!!!) � that really impressed me. The standard Forest model has always been a very decent sounding speaker, but the Forest Signatures were immediately recognized as a significant step-up, make that two steps up. The cabinet is completely different inside the Signature with a sealed compartment for the tweeter, and dual chambers with separate tuning and separate rear ports for the mid-woofer. Only the top 2% of drivers qualify for inclusion in the Signature version. Upgraded parts in the crossover and WBT binding posts for bi-wiring contribute to the Signature. Four finishes include the gorgeous clear mahogany veneer seen here, cherry veneer, and gloss black and gloss white for more contemporary settings. This is a more mature, sophisticated looking speaker than the Elements Series and sounds just about as good as I remember the Elements sounding. 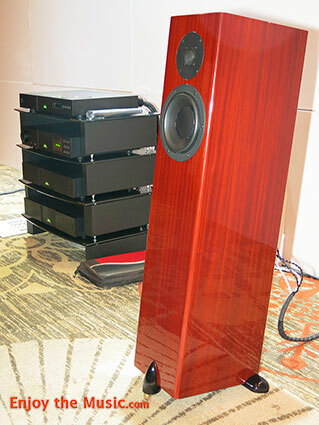 The Naim electronics with a CD player on top of the stack certainly did justice to the Forest Signature. The new kid in the Totem lineup was the diminutive Kin (two-way monitor) and Kin Flex (a M-T-M three-driver design) which is designed to show people how affordable real High End music can be at $400 US, each. The Kin Flex come with a mounting plate that allows you to mount them horizontally or vertically on the wall (say, beside a TV) or on the ceiling if you are doing Home Theater and want to use them in an Atmos system. 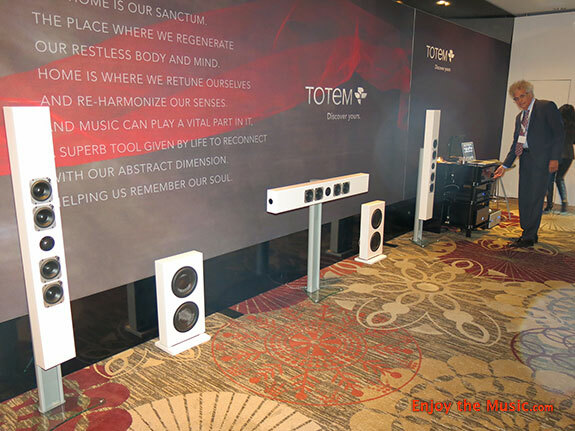 They are said to blend well with other Totem speakers, so you can use them as ad-ons if you're going from stereo to a surround configuration. 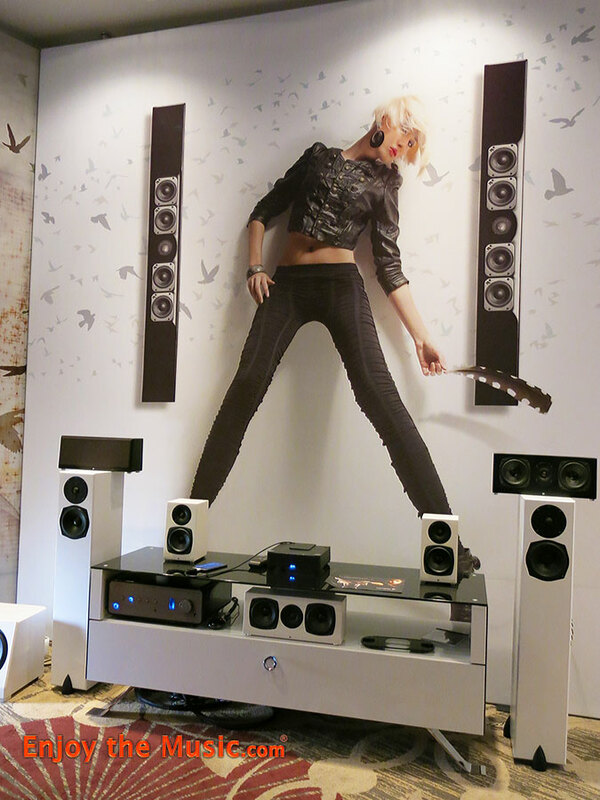 I heard them as a stereo pair (good for 100Hz to around 40 kHz), supplemented with a small subwoofer and they sounded quite good, filling the wall in the second photo in this large room. They were driven by an unidentified amplifier, but Totem is now promoting their new ARC digital amp with a KickStarter campaign with a lot of power that is said to drive these small speakers extremely well. 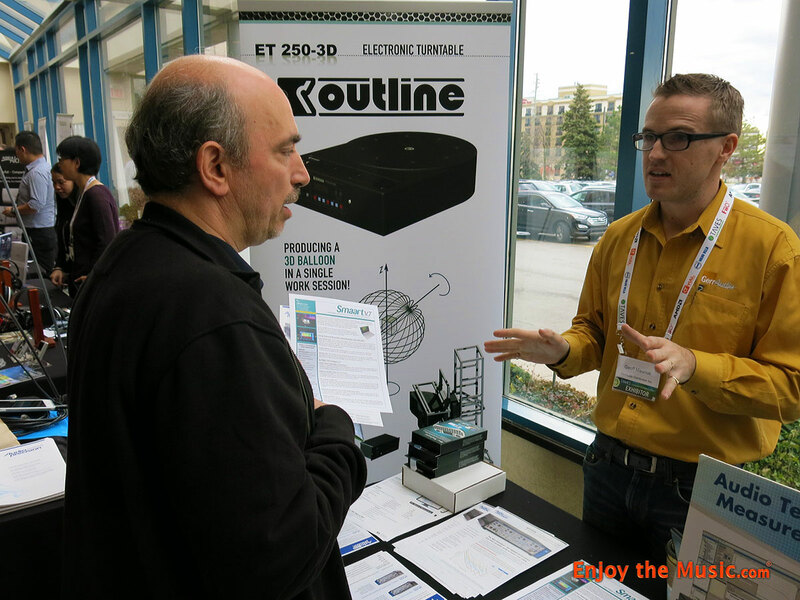 The ARC and Kin combination looks to be a very attractive lifestyle combination capable of connecting to TVs and a most digital sources � phones and pads, etc., making it an enticing gateway to the high-end. Also of note here was the stand from Custom Design UK that is seen supporting the Naim rig. 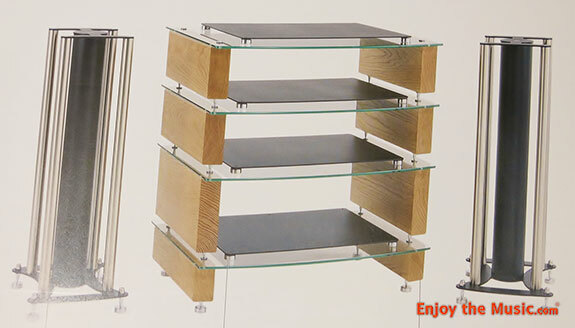 There was a poster detailing the construction that would be of interest to DIY types, although the 10mm glass shelves with polished edges would probably take a DIY project over the cost of buying it new. A variety of wood types and stains as well as clear or black glass are an option, as is different spacing between shelves. Quite attractive. 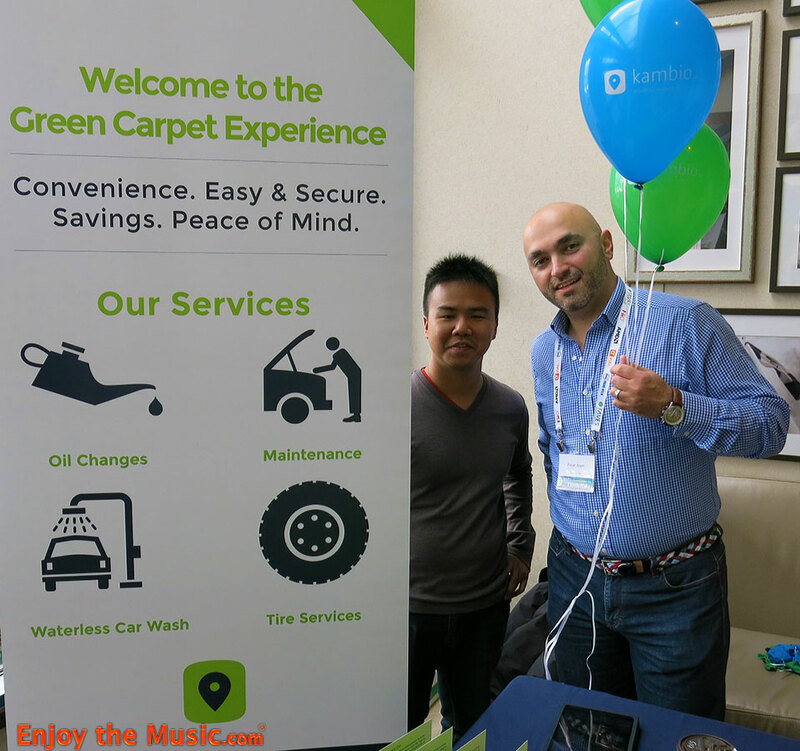 Out in the hallway was the Kambio table with leaflets for the Green Carpet Experience that needed some explaining, so I asked. 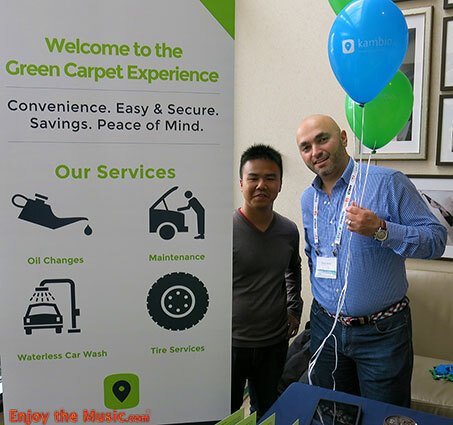 They provide car care services such as oil changes, minor maintenance, waterless car washing and tire services at your convenience and your location. Waterless car washing is not conducted with hand-held ultrasonic emitters, but with some kind of goop that is applied and wiped off by hand. Perfect for the audiophile who can't tear himself away from the music, or tweaking his system. Women audiophiles, of course, are smart enough to delegate such automotive chores to their husbands. Unfortunately, the doors were not wide enough to get my Tracker into the hallway to allow them to demonstrate their product on my vehicle. Next year I'll park right outside their window. 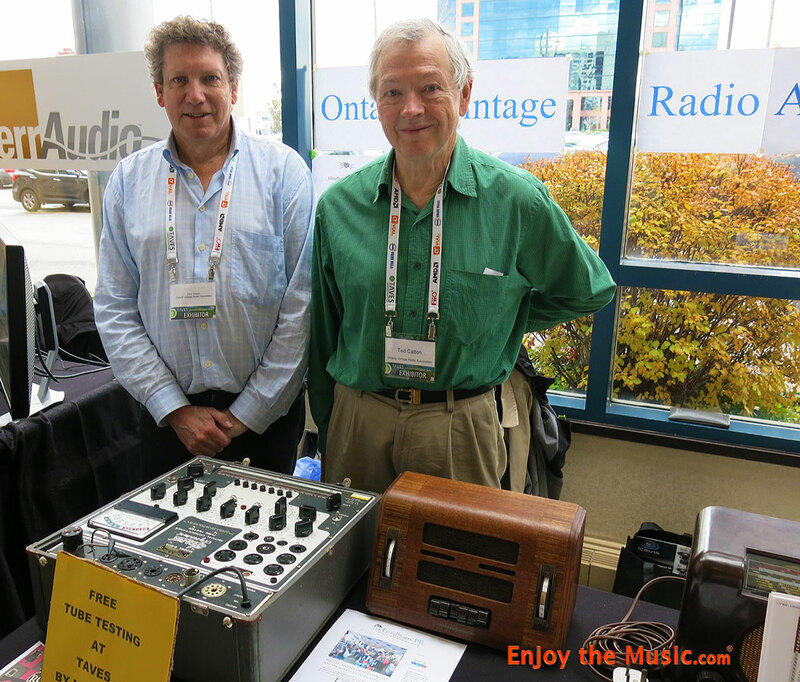 I spent a delightful couple of minutes chatting with Paul and Ted about the Ontario Vintage Radio Association. They not only had a few samples of the many table radios they've restored, but offered free tube testing to anyone with the foresight to bring their tubes with them to the show. These are the guys to talk to when your great uncle bequeaths you his mahogany veneer table radio, circa 1930. Unfortunately, they don't do Bakelite rotary dial telephones. GerrAudio Distribution, Inc., at the next table was staffed by Geoff Maurice, their technical sales engineer. These guys are a quantum leap above the Vintage Radio Association, offering gear for measuring room acoustics for the very serious audiophile, and above that, the professional sound engineer. One product offered was the Smaart. V.7. System Measurement Acoustic Analysis Real-time Tool) is a software tool for audio engineers for about $1100. 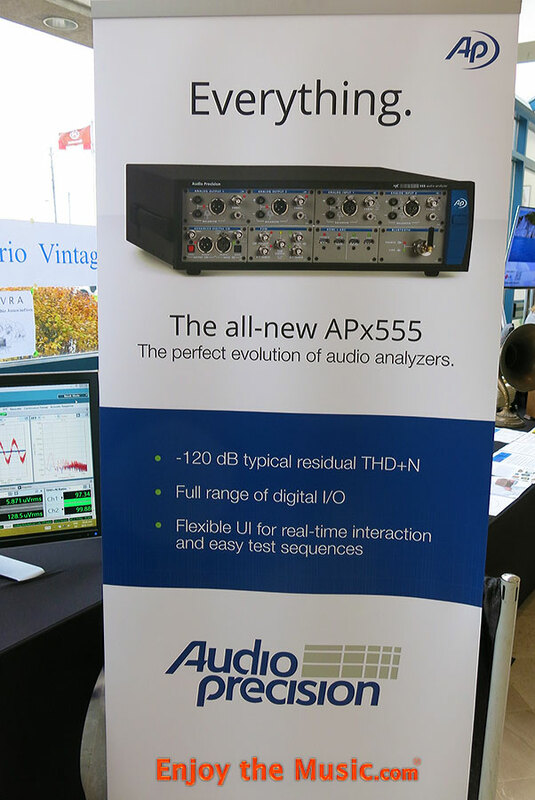 An Audio Precision APx515 analyzer was about $6500US and a larger 555 unit on display was about $30,000 to $40,000 depending on configuration. This was admittedly, way above my head, although I can certainly appreciate the importance of what they do. FiiO Electronics at the next table was getting a lot of attention with their small and affordable high-resolution audio players with built-in headphone amplifiers. The little guy on the left in the photo was $55 and the larger guy on the stand was $200. There was a noticeable difference in sound quality between the two, but they were both pretty amazing for the price. I don't use these devices when I'm hiking in the woods or bicycling, preferring to be more in tune with nature than tunes. Bears and Harley Davidsons have a way of sneaking up on you. 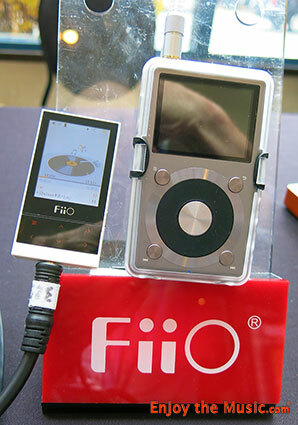 Speaking of which, as I admired the FiiO, Sunny Wang, the presenter at that table said to me "That guy would be your boss?" Sitting next to me, at the next table was Enjoy the Music.com's Creative Director, Steven R. Rochlin, without his steampunk accoutrements, disguised as a normal show attendee. Except, perhaps, for the immense camera setup he had with him, which reminded me of the famous words Neil Young uttered on "Live Rust": "When I get real big I'm gonna get an electric guitar..." Maybe, someday, Steven. 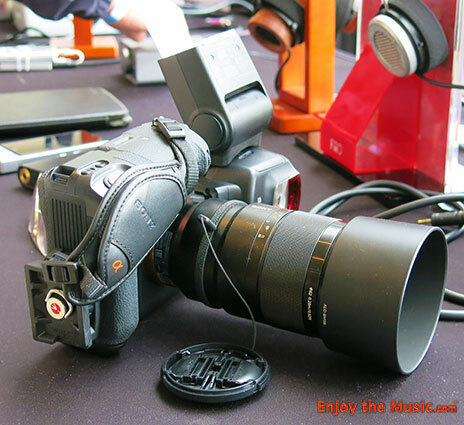 (Steven Sez: She takes great ultra-high-rez photos; too bad the nut behind the wheel has a screw or two loose). At the next table down was the OPPO presentation that I really wanted to explore, featuring the PV3 headphones and the HA-2 music player as well as their HA-1 headphone amp, DAC and preamp. 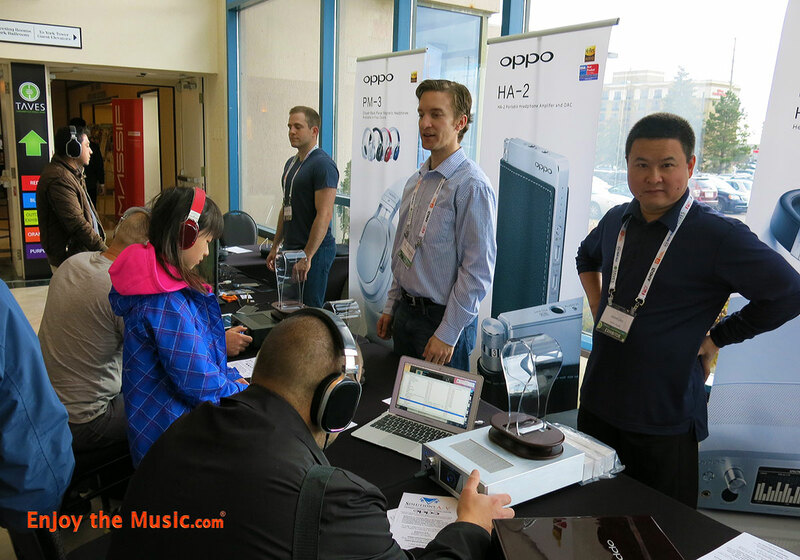 Every headset was in use, not just at that moment, but each of several times I passed by their table. This was a hot ticket at the show, for sure.